Talent/Profession:Painting/ drawing and mixing colors. Cutie Mark (only for ponies): Her cutie mark looks like paint splattered across her flank. It is several different colors. Powers: Oil Paint knows spells to make very vibrant colors, and to find the pigments that she needs to make her paints. She also knows basic Unicorn magic such as levitation and teleporting objects only. Physical Description: Oil Paint is the color of off white older canvas. 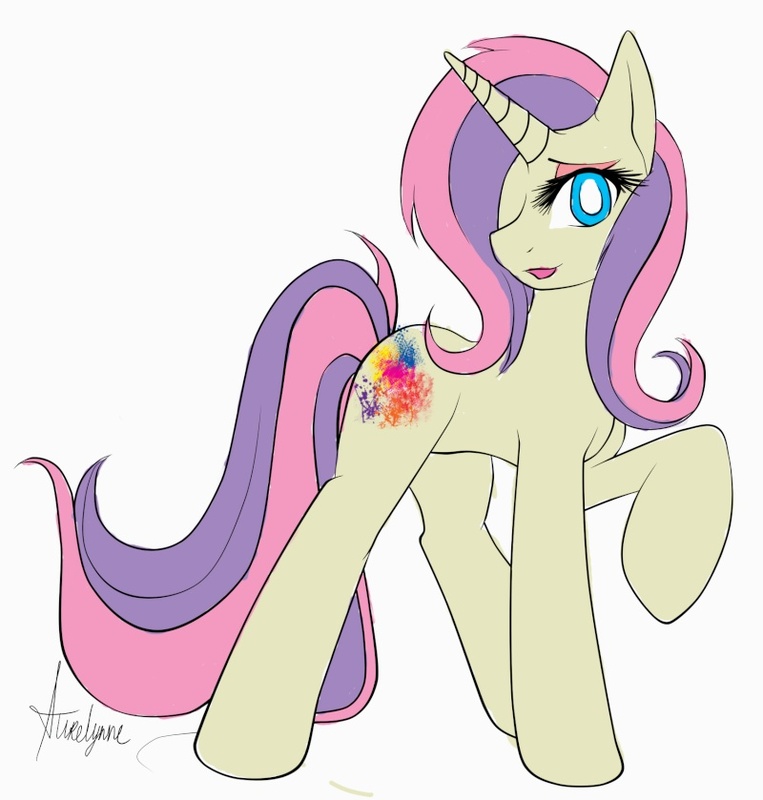 Her mane and tail are shades of pale pink and purple. She stands at average height. Her eyes are vibrant blue. She usually wears her tail and mane braided and pulled back for her face so that it doesn't get paint in the hair. She can often be found covered in paints. Personality: Oil Paint is happy god lucky and very bubbly. She loves to make friends. She tries to do her best no matter what she's doing. She is easy to get along with and is always willing to help out a friend in need. She loves to read about far off places and those places as she sees them can often be found in her paints. She is always painting fantasy works and Canterlot, as she thinks it looks as she's never been to the city. Oil Paint likes tea and sweets, and she is always covered in paint. She is always smiling and dreaming bigger. She can be seen from the street in her window painting or reading. She is kind and polite to every pony, and will always willing to help anypony in need. History: Oil Paint was just a child when she found her love for painting and as she kept at it she got better and better. One day after hours of working at the easel the young pony was covered in paints and her mother laughing helped give her a bath, but there was one stubborn spot that wouldn't come off. To her and her mother's great surprise the stubborn spot was actually her cutie mark! Oil Paint had been so wrapped up in her painting that she didn't even notice. When Oil Paint was older she decided to go to art school. She wanted to be an art teacher and has since accomplished her goal. She teaches private lessons out of her home most of the time and every one and a while teaches a class at the local school for the foals. She loves to teach and she loves the little foals and can often be heard encouraging them to do their best. Her parents are a big part of her life and she is always sending them paintings and letters. She loves them with all her heart and would do anything to take care of them. While she is a younger pony she lives on her own, with her small studio as her home. When Oil moved to Appleloosa she found it to be a scary place at first. She came to the town to be the art teacher there. After a few days she found her groove and fell right into the swing of the town's life. She found her way around and made friends there easily. She loves it now and would never leave. Other: While Oil Paint would like nothing more than to spend her days paints she can't she works odd jobs around town in order to keep her hobby. Every so often she gets a commission for a painting and she pours her heart and soul into the work. When she is working on a job that's not her painting she pours herself into believing that even in things you may not like to do, so you always give your best.